This fall has been an eventful one to say the least! My husband was recently offered a job as a software developer at Amazon and after some thought (ok, not too much thought – we’ve always dreamed of living on the West coast) we decided he was going to accept the position. This means shortly after Christmas, we are packing up and moving to Seattle! The thought of moving away from my family, my friends and my job makes me sad, but I’m incredibly excited about a new adventure. I first visited Seattle two weeks ago when we flew out to look for apartments; I knew it was a good sign when I didn’t want to leave. After way too many apartment tours, we found a place to live in South Lake Union. I am very excited to get back out there and continue exploring our new city. In addition to the craziness of our upcoming move, my husband and I decided to squeeze in a trip to Europe before we embark on our adventure. We leave in less than 1 week and plan to see 8 countries in 15 days. Yes, we are crazy, but 2 weeks of vacation time is hard to come by! Besides, I’m envisioning a bunch of European related blog posts upon our return. I was hoping to share this apple crisp recipe earlier this fall, but I quickly realized that a busy schedule leaves very little free time. 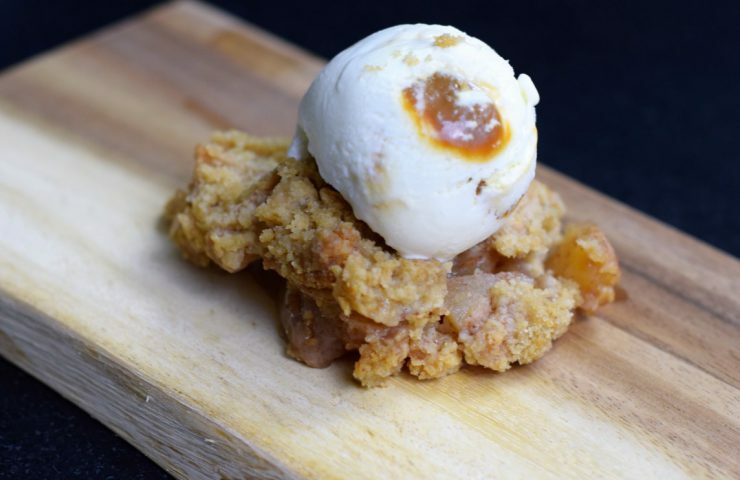 This apple crisp recipe comes from my mom and is one I grew up enjoying every year. It’s funny how you associate certain foods with different times of the year; as soon as the air gets cooler and the leaves start turning, I look forward to apple season and all of the great baking opportunities. There’s something so comforting about the warmth of the oven in the kitchen and the smell of freshly baked apples. It makes me want to brew a pot of coffee, put on a cozy pair of slippers and turn on the fireplace. Although I feel like we’re already experiencing winter here in Minnesota, Thanksgiving is just a few days away and this recipe is great to serve alongside your traditional pumpkin pie dessert. 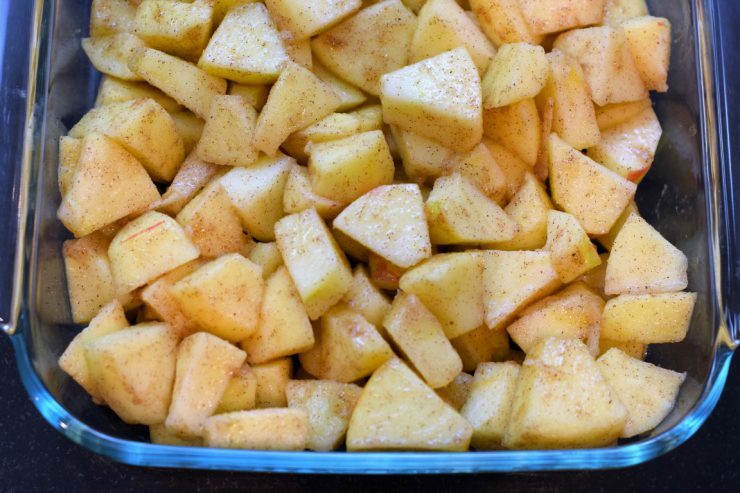 Besides peeling the apples, this recipe is very easy. If you own a peeler/corer, it gets even easier. Begin by preheating the oven to 350ºF and lightly greasing a 9″ x 13″ pan. You’ll notice in my pictures I’m using less apples and a smaller pan; I cut the recipe in half because it was just for my husband and me. Wash, peel, core and slice 10 apples. Cut each slice in 3 pieces so they are bite-sized. Place in a large bowl. In a small bowl, mix cinnamon, sugar, nutmeg and flour. 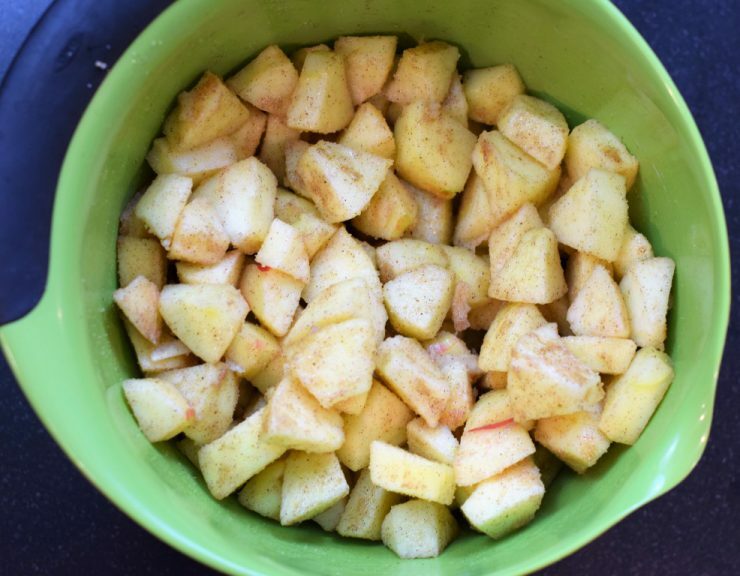 Mix well then pour over the apple slices and stir to coat each apple piece. In another bowl, combine brown sugar and flour. Cut in the butter until the mixtures becomes coarse and crumbly. 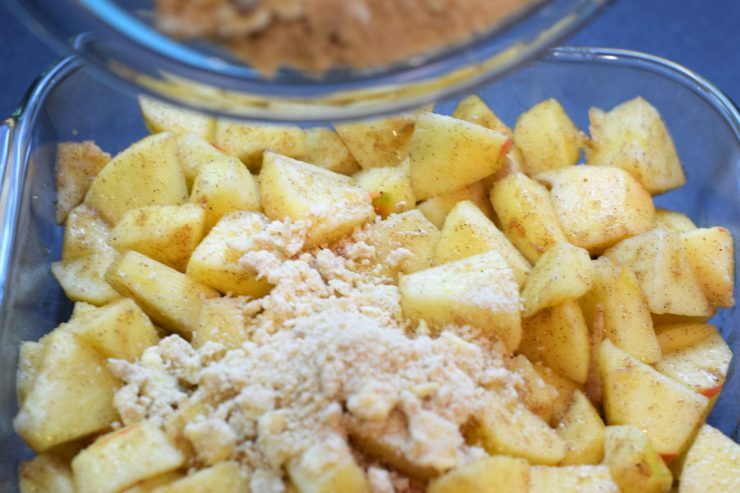 Place the apples in the pan then pour and evenly distribute the crumb mixture over the apples. 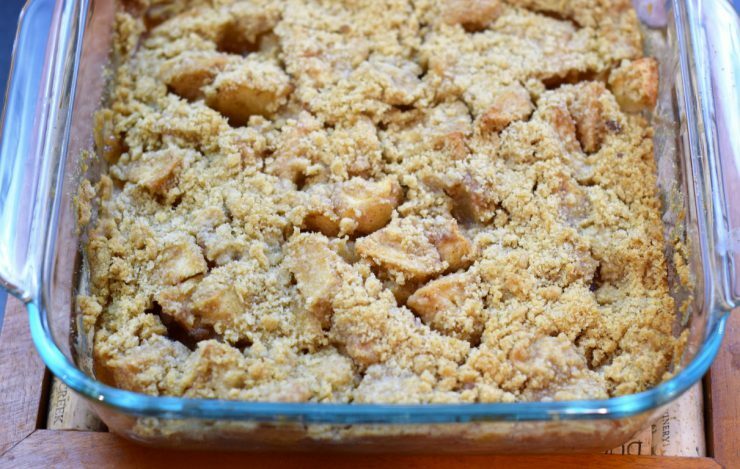 Bake for 45 minutes, until the apples are soft and the crumb mixture is lightly browned. Serve warm with homemade whipped cream or homemade ice cream! Preheat the oven to 350ºF. Lightly grease a 9" x 13" pan. 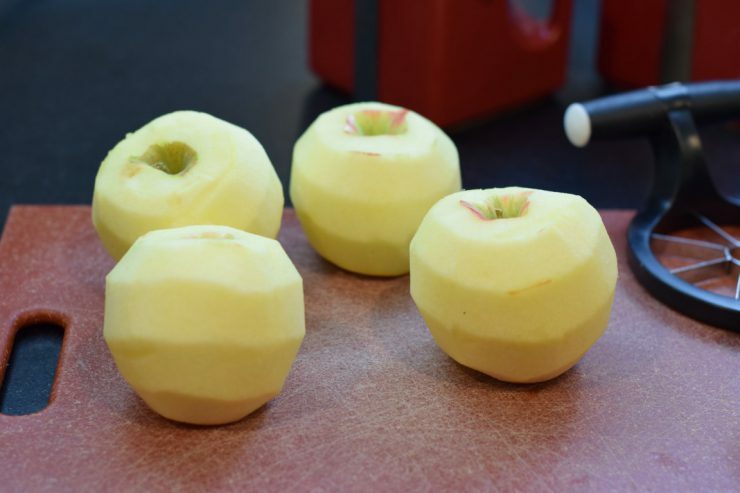 Cut each slice into 3 pieces so the apples are bite-sized. 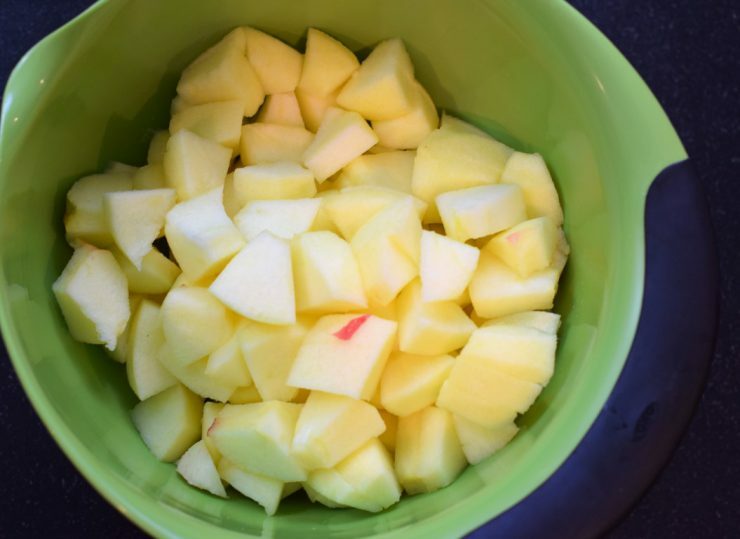 Place the apples in a large bowl. 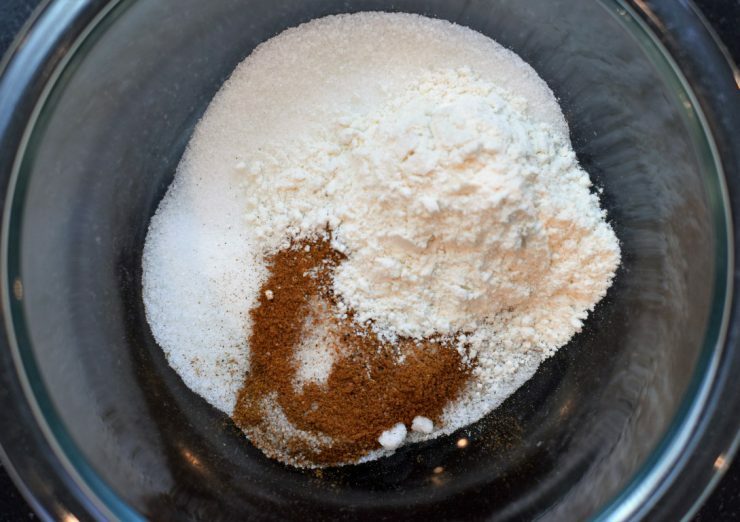 In a small bowl, combine sugar, cinnamon, nutmeg and flour. Pour over the apples and stir to coat. To prepare the topping, combine brown sugar and flour in a medium-sized bowl. 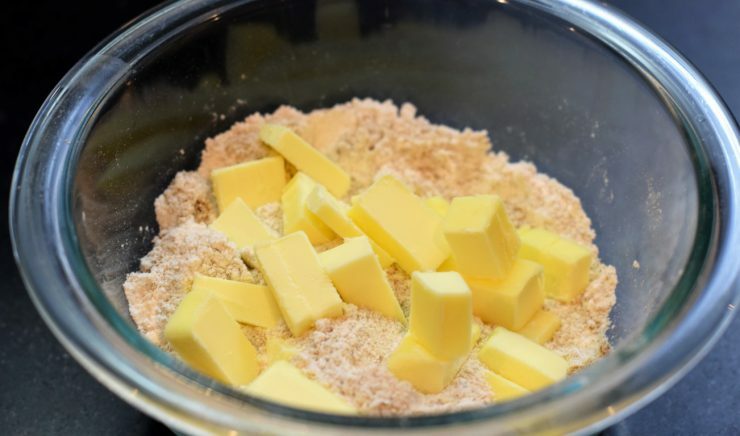 Cut the butter into the mixture until it becomes coarse and crumbly. Transfer the coated apples to the 9" x 13" pan. Cover the apples with the topping. 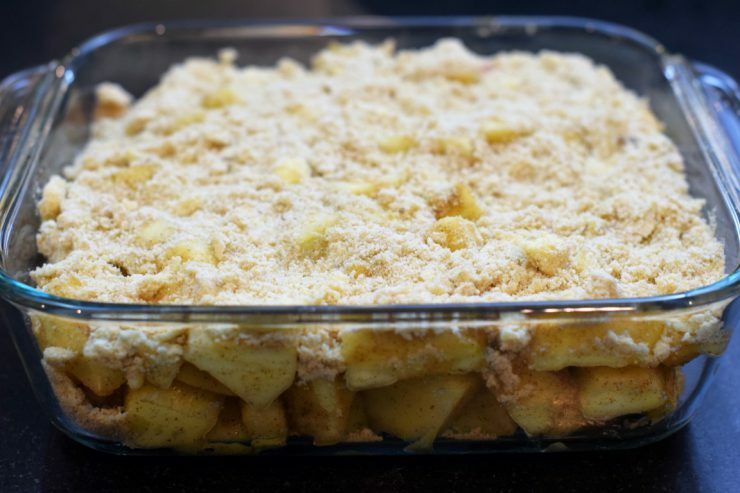 Bake for 45 minutes, or until the apples are soft and the crumb mixture is lightly browned. Serve warm with homemade whipped cream or ice cream!